In conjunction with the enormous light display, HRC has filed a Freedom of Information Act (FOIA) with the Department of Health and Human Services (HHS) for any and all records, including communications with the CDC, relating to the banned words from November 2016 onward. Reports initially surfaced on Friday in the Washington Post that the Trump-Pence Administration’s Department of Health and Human Services forbid CDC officials from using several words in critical budget documents. The CDC regularly engages in research and work impacting marginalized communities, including efforts to reduce health disparities among the transgender community. The ‘word ban’ appears to be just part of the ongoing effort by the Trump-Pence Administration to erase LGBTQ from reports and data collection. Earlier this week, Politico reported that the administration also kept hidden 10,000 comments on the Trump-Pence proposal granting exemptions for faith-based organizations in healthcare while only posting submissions that praise the administration’s policies. 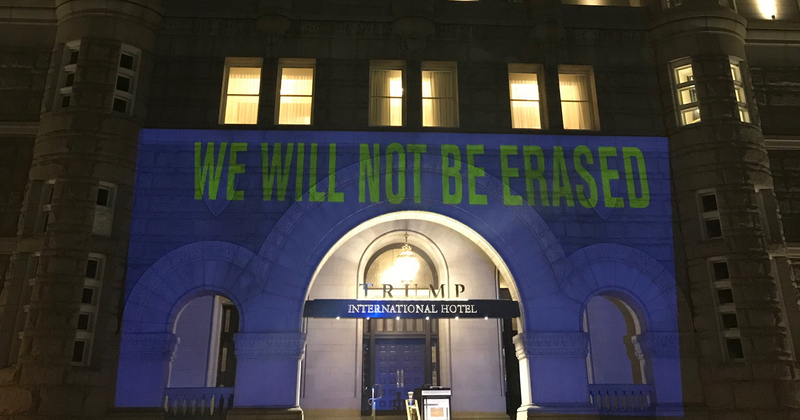 Following the light protest at the Trump International Hotel, for the remainder of the evening beginning at 8 PM ET, the display will be projected onto the side of the eight-story Human Rights Campaign headquarters at the corner of Rhode Island Ave and 17th St. NW in Washington, DC.